The authors have been involved in the construction industry for the last 20 years, specializing in affordable, low-tech, low-impact building methods that are as natural as possible. 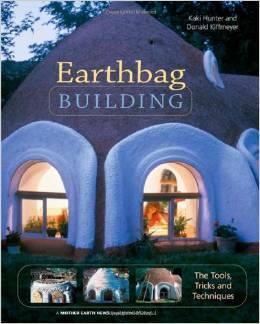 The authors explain how Earthbag Building is an enduring, tree-free type of architecture that can be used to create arched and domed structures of great beauty. Few other building systems are as ecological and affordable. 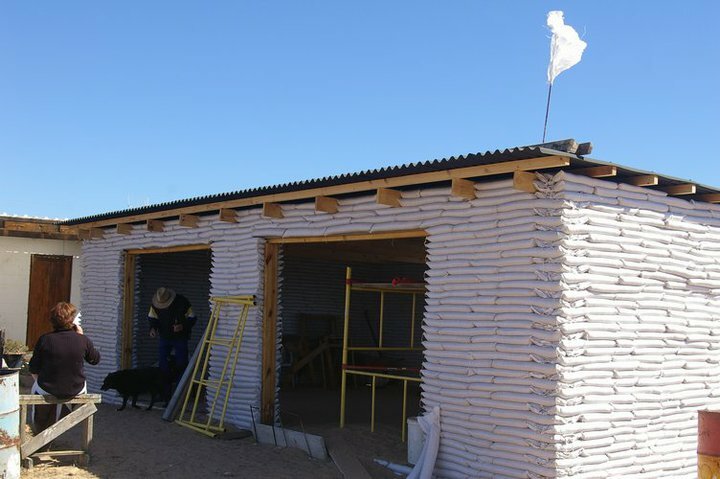 With a shovel, some empty grain bags and some dirt, you are all set to build with this fire-proof, insect-resistant building system. A row of earth filled bags is laid, and then tamped down. Then two strands of barbed wire are laid across the top of the row of bags. Then the next row of bags is laid down and tamped. The secret of this building system is there must be some clay content in the moistened soil that is used. Then the bags of tamped down dirt will dry out and set like adobe bricks. The bags help the dirt stay in the correct shape while drying. Later chicken wire or plastic mesh can be tied to the earthen wall. Plaster can then be applied to the wall for a smooth surface. One of the most interesting parts of the book for me was the chapter on foundations. Poured concrete footing and stem walls are the conventional foundation system approved by current building codes. Cement is used heavily in most modern construction including bridges, sky scrapers, highways, sidewalks, swimming pools, etc. It takes a lot of energy to produce cement. In the USA it takes 4 gallons of gasoline or diesel fuel to produce 1 bag of cement. The production of one ton of cement emits one ton of carbon dioxide into the atmosphere. The authors suggest that humans learn to minimize their use of cement for the sake of the planet. 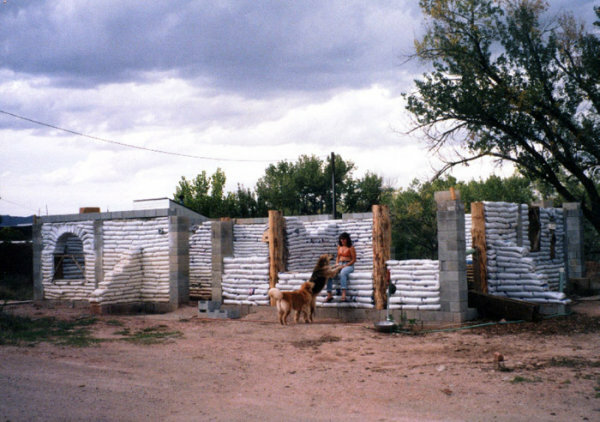 As an alternative to a solid cement foundation, the author uses bags of “Stabilized Earth Mix.” By adding 6 to 15 percent of cement mix to the soil, bags of cement-soil can be used as a foundation. For this mix, sandy soil with no clay is better. Two rows of cement-soil can be placed on top of a gravel filled trench, and this works well as a stable foundation. Once it is cured the fabric of the bag can be removed and the dry cement-soil has the appearance of stone. Above the two rows of cement-soil, bags of regular soil are used. However, a waterproof membrane should be placed between the cement mix row and the first soil row. Another alternative is to use lime and soil for a stable foundation mix. Type S – Hydrated Lime comes in dry powdered form. It works well with soil that has some clay in it. Lime was successfully used as a soil stabilizer on roadwork in the 1920s. Lime is better choice for the environment as it takes much less energy to produce. The “Earthship” houses designed by Mike Reynolds use old tires firmly packed with soil as a stem wall foundation. Rammed earth or gravel filled used tires make good use of a plentiful man-made product that is considered to be garbage. 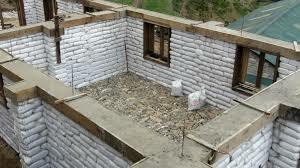 To avoid using cement, regular soil can be used in an Earthbag foundation, if 2 inch rigid foam insulation is carefully placed around the bag wall. Heavy plastic sheeting can be used around the insulation to further protect the underground Earthbag foundation from water. 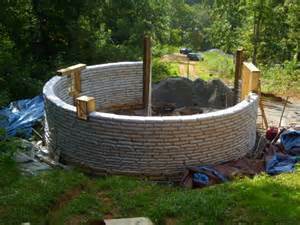 An Earth-Bermed or Earth-Sheltered wall can be successfully placed up to 4 feet below ground level. 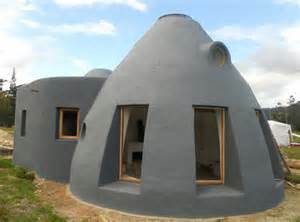 The author recommends building the structure in a round shape as it will better handle the stress of the dirt backfill up against the insulated walls. When the backfill soil puts pressure on the walls of a round structure, the compression is equally distributed. A French Drain should be placed around these structures to ensure adequate drainage. 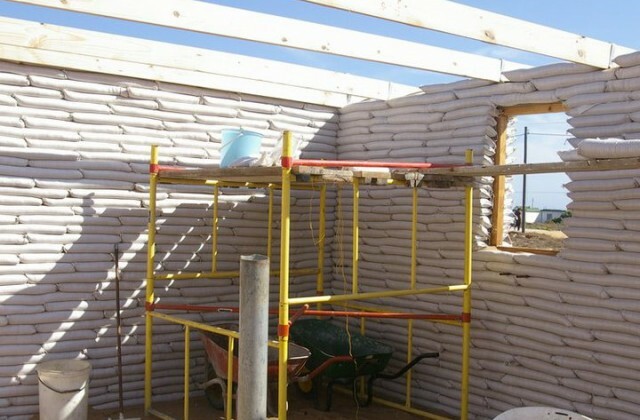 One common strategy for getting a building permit where building officials are not familiar with Earthbag construction is to use a Post and Beam frame as the load bearing structure. The Earthbags are then used to fill the spaces between and around the wood posts. One builder used load bearing concrete posts and beams to obtain building permit. The electrical system and plumbing pipes are tied to the completed Earthbag wall, before the plaster layer goes on. Shelf brackets and be sandwiched between the rows of Earthbags to create a shelf attached to the wall inside the house. At the top of the Earthbag wall, a continuous bond beam made of wood or concrete is usually installed. The bond beam acts as a tension ring that ties all the walls together into one monolithic frame. This continuous bond beam is the building code design currently used in Adobe and Rammed Earth structures. The Earthbags can be formed into a dome roof, or a more traditional wood or metal roof can be used. 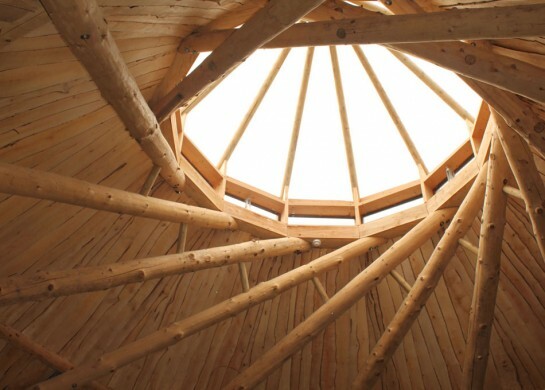 Many different interesting roofing options are available for Earthbag homes, including a grain silo roof, a spiral wooden roof, and a Yurt lightweight compression roof system. The book concludes with many resources such as how to make your own bag stand and tamping tools, and where to buy bags, etc. PreviousReady for Tiny House Roof!